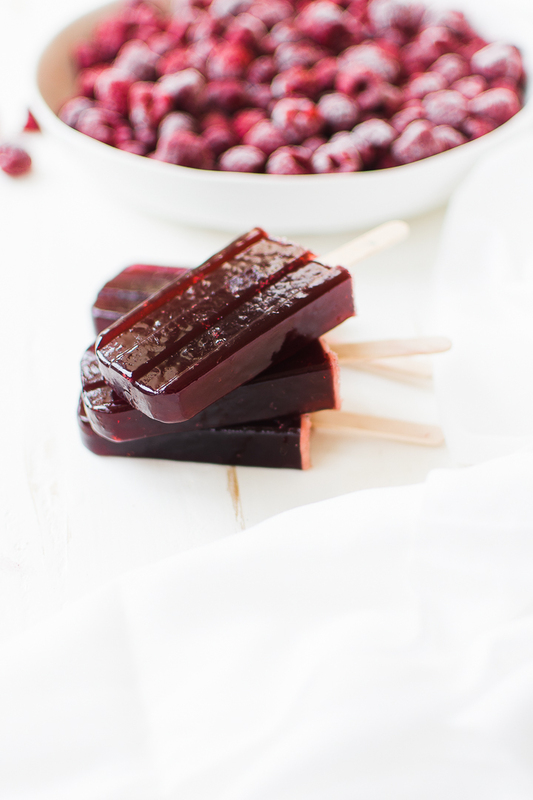 Ruby red, delicately floral and sweet with a punch of tartness, raspberry popsicles always seem to have a place in my freezer, tucked away for lazy afternoons. When the boys are playing outside and inevitably come in, desperate for a treat, it’s easy enough to pluck a popsicle out of the freezer and hand it over, knowing that it’ll cool them down and provide some element of joy. I enjoy them too, on summer evenings when the sun lingers in the sky. Sometimes I’ll pair it with Prosecco or my homemade raspberry liqueur. Raspberries only really reach their peak of ripeness – sweetness, flavor and antioxidant capacity – in the summer. Just like all berries, raspberries are fragile and if picked too early, they lack flavor. 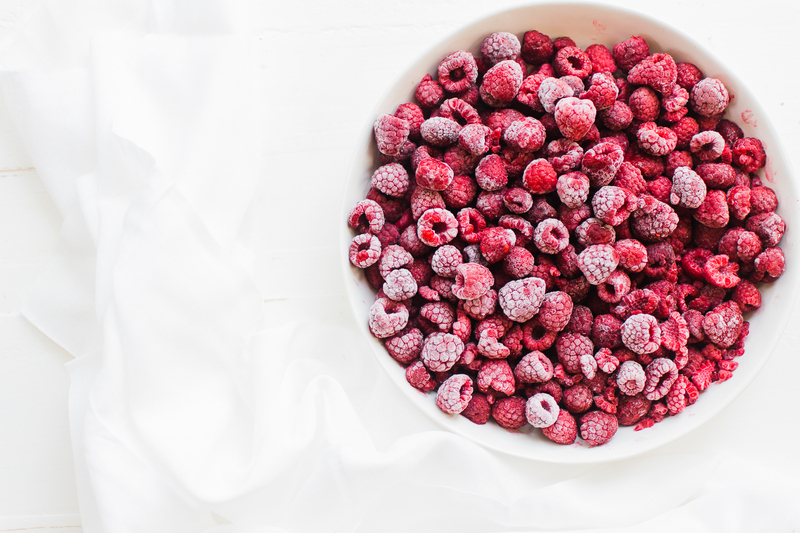 This makes frozen raspberries a particularly good year-round choice, since they’re picked at the peak of ripeness and flash-frozen to preserve their flavor, nutrition and the overall integrity of the fruit. 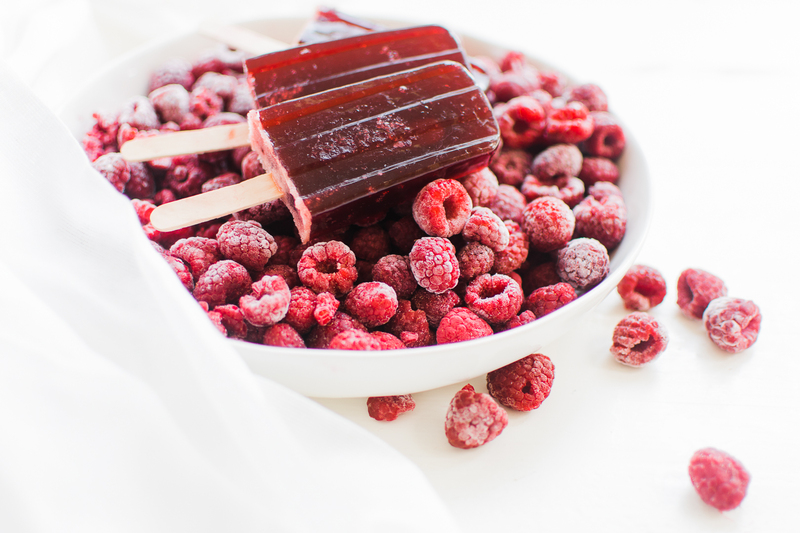 To make raspberry popsicles, you’ll start by sweetening the fruit with just a touch of honey and reinforcing the raspberries’ acidity with a splash of lemon juice, simmering them together before straining away the seeds. No one likes sticky hands. To keep popsicles from dripping, before pouring the popsicle juice into molds and freezing them, whisk in a little gelatin. The protein structure in gelatin will help keep the popsicles in a semi-solid state as they thaw. So instead of dripping and running down your hands, the popsicles resemble Jello as they thaw – making clean up much easier. Because gelatin contains protein, you’re not only preventing sticky hands, you’re also adding a boost of nutrition too. 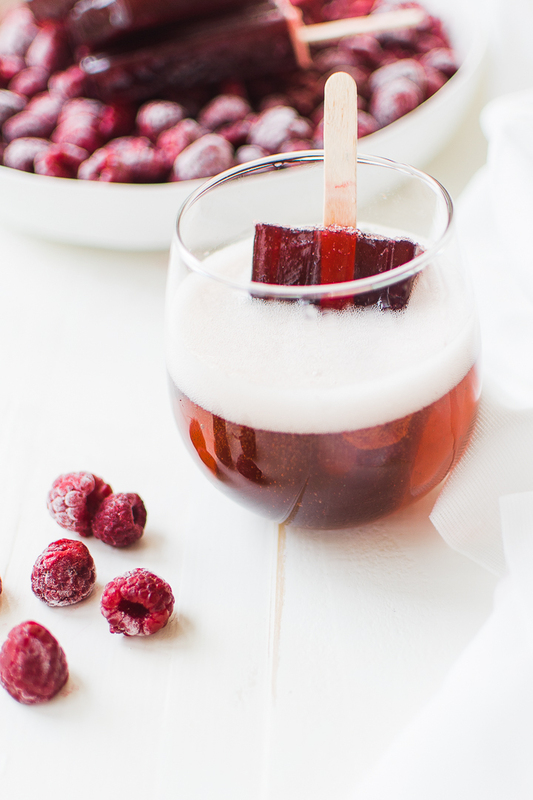 For a grownup treat, pair these popsicles with Prosecco brightened by a splash of Creme de Framboise or other raspberry liqueur. No one likes to feel deprived, so here are some of our favorite ways to use raspberries (and other berries!). You can find frozen berries year-round, and they’re picked at the peak of ripeness. No more waiting until summertime. Raspberry Yogurt Bark is super simple to make and a nice, wholesome treat for grownups (or kids). Raspberry Whole Fruit Sorbet is an easy sorbet that you can make in your blender with just three ingredients. Kefir Berry Pops are super fun for July 4th and include strawberry puree, blueberries and a dollop of kefir for probiotic goodness. Blackberry Mint Popsicles are delightful to make late in the summer, when the berries are at their darkest and their ripest. ← THE Best Pizza Zucchini Boats Ever for a Clean Eating Night In!